2019 is set to be another year of continued growth for many Housewares and Home Furnishings retailers, as the industry continues to demonstrate resilience in today’s difficult-to navigate retail landscape. As the top home furnishings retailers optimize their existing markets and enter green fields, competition is sure to increase. Marketing and merchandising teams are running targeted campaigns and adjusting mattress inventories as Housewares/Home Furnishing vie for newly available market share in response to the Mattress Firm and Innovative Mattress Solutions bankruptcies. The industry is also seeing many newcomers entering their trade areas. Last year, Capser opened its first physical store and announced many more to come. In addition, Wayfair has opened two pop-up stores, with management commenting the Company is experimenting with physical sites “to determine the best format to offer shoppers in the future.” Meanwhile, the clicks-to-bricks trend continues with an increasing number of e-tailers recognizing the importance of a brick and mortar presence. Following Shopko Note Holdings’ (the $35.0 million term loan B-1 lender whose affiliates are Spirit MTA REIT) statement that Shopko should liquidate after the sale of pharmacy assets fell short of the milestone set in the DIP financing agreement and has to date failed to find an equity sponsor despite its efforts over the past year, an attorney for Shopko insisted the Debtor is still on track to reorganize and happy with the pharmacy auction proceeds, while it expects to amend the DIP financing budget to reflect the lower pharmacy auction proceeds. The Judge in the case also warned Shopko Note Holdings to “be careful” in their filings going forward, and “there’s a lot of jobs at stake here.” In response, an attorney for Shopko Note Holding said it had supported the retailer in its efforts to find a buyer over the last year but was “just asking for a dose of reality.” An attorney representing the unsecured creditors committee supported the Debtor’s reorganization plan. In other Court filings, McKesson has withdrawn its motion to transfer the venue to the Eastern District of Wisconsin, as part of a stipulation agreement it entered with the Debtor. McKesson shall retain its right to assert a claim and file a claim for reclamation but will be junior and subordinate to DIP financing and subject to certain other restrictions related to the DIP financing, including the final indefeasible payment in full of all its obligations. The 341(a) Meeting of Creditors for the Shopko Stores, DIP Chapter 11 proceedings will be held on February 25. The Company filed an amended motion to set March 18 as the bar date (Claims Bar Date) for prepetition and administrative claims, instead of February 15. The proposed rejection damages bar date, including for unexpired leases, is the later of either the Claims Bar Date or the governmental bar date, which is expected to be July 15, and the date that is 30 days following entry of an order approving the rejection of any contract or unexpired lease. Walgreens Boots Alliance won the bid for 63 of the 120 Shopko pharmacies that were put up for auction last week. CVS won 13 of the pharmacies, Albertson's won seven, Hy-Vee and Lewis Drug each won six, Rite Aid won five, and various smaller regional and local pharmacies won the rest of the Shopko pharmacy business. Topgolf International, Inc. (dba Topgolf Entertainment Group [TEG]), founded in the U.K. in 2000, is an experiential golf and entertainment concept, utilizing technology for customers of any level to play golf. 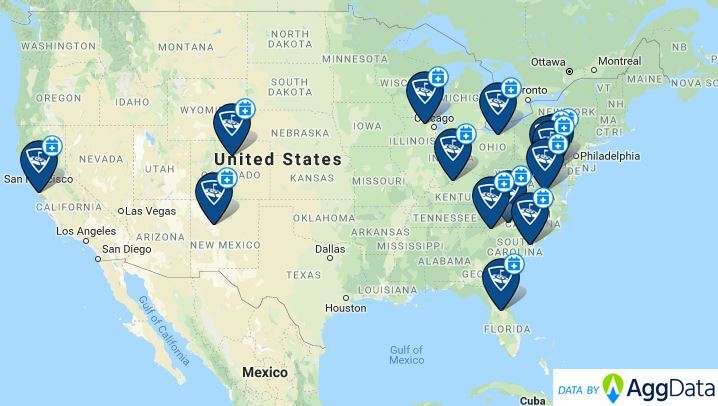 Since its founding the Company has grown significantly, and currently operates 52 locations (as of January 2019) across the U.S. (48), U.K. (3), and Australia (1). While the traditional golf industry has been in a slight downturn, Topgolf has managed to grow its top line and grab market share in the alternative golf segment. Topgolf differentiates itself from traditional golf concepts by offering a party-like atmosphere where customers can eat, drink and socialize while playing golf. Approximately 55% of the Company’s sales are generated from food and beverages, compared to just 30% for a traditional golf concept. 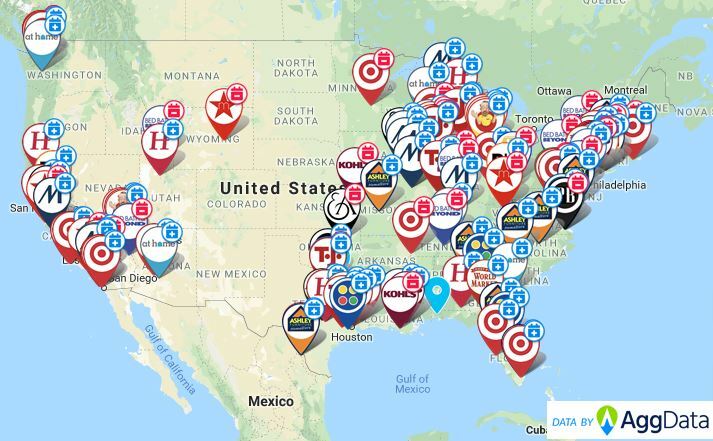 In 2018, the Company opened another 10 venues, increasing its count to 51, and we estimate sales grew to approximately $900.0 million, with average revenue per location approaching $20.0 million. Going forward, growth is expected to continue in fiscal 2019, with an anticipated 11 new openings. Topgolf International is in the process of opening future stores, for a list of the locations, click here. Published reports said Things Remembered is preparing to file for Chapter 11 bankruptcy protection and potentially close most of its 450 stores. The Company has hired investment bank Miller Buckfire & Co, owned by Stifel Financial, and restructuring lawyers at Kirkland & Ellis. Things Remembered is a mall-based retailer founded 40 years ago to sell engraved gifts. It was acquired in 2012 by private equity firm Madison Dearborn, which exited the investment in 2017 when the Company received backing by a consortium including private equity firm KKR. According to reports, Things Remembered has roughly $120.0 million in debt. CVS Health announced that its Aetna business has entered into a four-year reinsurance arrangement with Vitality Re X Limited as part of its long-term capital management strategy. The arrangement allows CVS Health to reduce its required capital and provides $200.0 million of collateralized excess of loss reinsurance coverage on a portion of Aetna’s group commercial health insurance business. Vitality Re X Limited is a newly formed insurance company which issued health insurance-linked notes in a private offering in connection with this transaction. On Friday, iFresh Inc. announced that CEO and founder Long Deng has agreed to sell 8.3 million shares (representing 51% of the total outstanding shares) to HK Xu Ding Co. Ltd. Subsequent to the transaction, Mr. Deng will still own approximately 2 million shares (12%). Overall, this stock sale points to a change of direction by Mr. Deng, who is relinquishing control of the Company for a fraction of what it was worth less than one year ago. The Company also announced it is evaluating a potential acquisition of a financial technology company in China and confirmed it is in negotiations with third-party independent buyers for some of its underperforming stores. Meanwhile, after it was originally announced in 2017, iFresh Inc. finally opened its first supermarket on Long Island, in Carle Place. The delayed opening highlights the Company’s struggles, as it has committed to opening multiple stores that require capital it doesn’t have. The new store offers specialty Asian foods, snacks, beverages and household items, including many locally sourced and seasonal products, as well as freshly prepared grab-and-go items. CEO Long Deng commented that “the management team expects this newly opened supermarket to achieve $13.0 million – $15.0 million in revenue for the fiscal year 2019.” Headquartered in Long Island City, NY, iFresh operates nine supermarkets along the Eastern seaboard, with additional stores in Glen Cove, Connecticut, and Miami opening soon, and two in-house wholesale businesses. Staples and Essendant have agreed to a settlement as part of their proposed $482.7 million merger in order to resolve FTC allegations that the transaction may harm competition in the market for office supply products sold to small and mid-sized businesses. Under the agreement with the FTC, Staples will establish a firewall separating its business-to-business sales operations from Essendant’s wholesale business. The firewall will restrict Staples’ access to the commercially sensitive information of Essendant’s customers. The FTC alleged that Staples competes with Essendant-sourced independent dealers to sell office supplies to mid-sized business customers. The acquisition would give Staples access to commercially sensitive business information on Essendant’s reseller customers, and those resellers’ end customers, which could allow Staples to offer higher prices than it otherwise would when bidding against a reseller for an end customer’s business. The proposed settlement will limit access to commercially sensitive information of dealers who buy from Essendant, including those dealers’ data about their customers, to only those Staples employees who will be performing wholesale functions. The agreement is subject to public comment for 30 days through February 27. After 30 days, the Commission again will review the proposed consent agreement and comments received, and decide whether it should withdraw from the consent agreement, or modify the accompanying order, based on any new information it may receive. In other news, Staples announced Robert Baldrey is leaving his position as VP Northern Region at the end of February. Mr. Baldrey joined Staples in 2017 as managing director for the U.K. and Ireland on an interim basis and was promoted to his current role at the end of November. The Company cited “cost cutting through further management consolidation” as the reason for his departure. Walmart is opening a newly constructed 340,000 square-foot high-tech consolidation center, the first in its supply chain to receive, sort and ship freight, in Colton, CA, in July. Automated technology will enable the facility, which is also a warehouse, to move three times as many cases. The Company plans to increase the number of employees from 175 when it opens to more than 600 by 2021. Consolidation centers receive less than a truckload (LTL) of general merchandise from suppliers, consolidate quantities into a full truckload (TL), and ship it to regional distribution centers. Walmart operates 42 regional DCs, which handle distribution to stores, and in October broke ground on a new tech-enabled perishable grocery distribution center in Shafter, CA. The Company also operates consolidation centers, but until this point the centers have used a manual process. In other news, Walmart is hiring “hundreds” of truck drivers in 2019 and increasing their pay amid the national driver shortage. Walmart, which runs the third largest private-trucking fleet in the country, added more than 1,400 new Walmart truck drivers in 2018. Walmart is raising driver pay beginning in February with a $0.01 per mile increase and additional pay for every arrival. Walmart drivers will now earn on average $87,500 a year. Ahold Delhaize announced net sales of €16.55 billion for the fourth quarter ended December 30, up 5%, or 3% at constant exchange rates. For the full year, net sales were €62.79 billion, down 0.2%, or up 2.5% at constant exchange rates. Sales performance in the U.S. continued to show momentum, with 2.7% comparable sales growth (excluding gasoline) in the fourth quarter. The Company noted it saw a lower level of inflation compared to the previous quarter. Online sales growth increased 12.1%, as food e-Commerce initiatives gained traction. In other news, Ahold Delhaize’s Giant Food Stores (Carlisle, PA) will debut a new retail concept with the opening of a 38,000 square-foot “Giant Direct, Powered by Peapod” e-commerce hub in Lancaster, PA on February 12. In partnership with Peapod Digital Labs, Giant Direct will offer a pickup option where online orders can be delivered directly to customer vehicles that have pulled up outside, or sent to their homes or business. The new hub will also feature a walk-up vestibule with easy-order tablets. Giant Direct will replace the current branding model of “Peapod by Giant.” The concept is part of a $22.0 million investment in Lancaster County first announced in June 2018. Parachute, a direct-to-consumer business selling bedding and towels, began selling mattresses ranging in price from $1,299 to $2,199 on January 17. The mattresses will be available online but can also be viewed at the Company’s five brick-and-mortar locations in Los Angeles, New York City, San Francisco, Portland and Chicago. The Company aims to expand its physical presence as well, with the target of having 20 stores operating by 2020. Jumping into the mattress scene brings the Company into competition with a wave of direct-to-consumer mattress companies like Casper, Leesa, Tuft & Needle, and Nectar, but the Company says it differentiates its product by using wool rather than foam. The mattress sector is changing rapidly following the bankruptcies of Mattress Firm in October 2018 and Innovative Mattress Solutions (which operates Mattress Warehouse, Mattress King, and Sleep Outfitters) earlier this month. Mattress Firm emerged in November 2018 with about 2,600 stores across the country, after closing more than 500 stores during the bankruptcy process. IMS plans to close an unspecified number of its 142 stores and sell the remaining business as a going concern. Another competitor, Nest Bedding, announced an Amazon-exclusive mattress earlier this month and plans to open at least 15 stores by the end of the year. Meanwhile, Casper plans to open 200 stores across North America. On January 24, Fred’s announced that it had completed the transfer of prescription files to Walgreens from 179 of its pharmacies, for total consideration of $156.1 million plus $20.6 million in inventory. The transaction leaves Fred’s with 168 remaining pharmacies in its 597-store base. The Company has said that it is looking to sell the additional script files and indications are that its Memphis, TN headquarters building and distribution center are under contract to be sold. On January 28, Bojangles announced the completion of its acquisition by Durational Capital Management LP and The Jordan Company, L.P. Bojangles’ shareholders had previously approved the $16.10-per-share deal on January 10. The Company has ceased trading and will be delisted from the NASDAQ. Following the completion of the acquisition, Bojangles announced the appointment of Jose Armario as CEO and Brian Unger as COO, both formerly of McDonalds. Mr. Armario replaces board member James Kibler, who had been serving as interim CEO and president since the previous CEO, Clifton Rutledge, resigned last March. Starbucks reported first quarter revenue growth of 9.2% to $6.63 billion. Global comps were up 4%, driven by a 3% increase in average ticket. Americas and U.S. comp sales increased 4%, and 1% in China. The Company opened 541 net new stores during the quarter, bringing its total store count to 29,865, a 7% increase over the prior year. Over two-thirds of the net new store openings were outside the U.S.; approximately 50% were licensed. Operating income rose 3% to $1.00 billion. Operating margin of 22% declined 100 basis points, primarily due to higher wage and benefit-related investments, product-related mix shifts, and higher restructuring costs and asset impairments, partially offset by sales leverage. Meanwhile, Starbucks announced the expansion of its Starbucks Delivers pilot to an additional six U.S. cities, beginning with San Francisco last week and reaching select stores in Boston, Chicago, Los Angeles, New York and D.C. in the coming weeks. The Company has partnered with Uber Eats for the pilot. Including its initial test in Miami last fall, the Company remains on track to bring the service to seven cities and nearly a quarter of U.S. Company-operated stores by this spring. London will become the first European city to trial Starbucks Delivers, followed by planned initiatives in India, Hong Kong, Singapore, Indonesia, Vietnam, Mexico, Colombia and Chile in the coming months. Starbucks already has a significant delivery business in China, using Alibaba Group Holding’s Ele.me platform, involving 2,000 stores across 30 cities in China. Fry’s Electronics is a private regional consumer electronics retailer with a brick-and-mortar presence that stretches from its headquarters in the West Coast to the Midwest and Central regions of the U.S. The Company’s 34 retail stores are predominantly located in California and Texas, with a more limited presence in the Midwest and Southeast. Fry’s carries an expansive selection of over 50,000 SKUs in each of its stores, more than most consumer electronics retailers. The Company’s stores are large by industry standards, ranging from 50,000 square feet to 180,000 square feet. By contrast, Best Buy’s stores average only 39,000 square feet. The Company competes most prominently with Best Buy, as well as with mass merchandisers Costco, Target, and Walmart, as well as Staples. Almost 62% of the Company’s stores are located within a three-mile radius of a Best Buy location. The maps below show Fry’s proximity to Best Buy stores in both Northern and Southern California, which are the Company’s largest markets. Alimentation Couche-Tard will introduce Circle K fuel to 132 convenience stores in Missouri and Illinois by the end of January as part of its global rebranding. The locations are primarily in the St. Louis metro area and central and southern Illinois markets; additional sites in the region will be converted to the brand within the next several months. As of October, more than 4,050 locations in North America and more than 1,800 sites in Europe displayed the brand. Couche-Tard has 9,943 convenience stores in North America and 2,718 international stores; including global licensing agreements, its worldwide network spans more than 16,000 locations. Following extensive remodels and upgrades, Brookshire Grocery Co. reopened two stores in Bullard and Lindale, TX. The stores feature new signage, paint, décor, flooring and energy-efficient lighting, online ordering with curbside pickup, fresh sushi, and expanded full-service meat and seafood counters. One of the locations has a drive-thru lane for its pharmacy. The stores also offer same-day home delivery through Instacart, which the Company has at more than 100 stores and plans to expand to additional locations this year. Brookshire Grocery Co. operates more than 180 stores in Texas, Louisiana and Arkansas. K-VA-T opened its second Food City in Dalton, GA last week. The 48,600 square-foot supermarket includes a pharmacy, in-store bakery, deli with a hot food bar, full-service meat and seafood departments, floral shop, and an expanded selection of gourmet, international and specialty items. The new store will also offer K-VA-T’s GoCart curbside pick-up. Meanwhile, the Company plans to open a similarly sized store in Fort Oglethorpe, GA. Food City President Steve Smith said the new supermarket is part of a $10.0 million development Food City is building to replace its former East Ridge location, which closed last April. K-VA-T operates about 130 retail outlets throughout Southeast Kentucky, Southwest Virginia, East Tennessee, and North Georgia. Southeastern Grocers will close an underperforming BI-LO store in Waynesville, NC the last week of February; it has begun liquidating its inventory there. The news comes just as Publix opened a new store nearby. Grocery Outlet will open its fifth Ventura County Bargain Market location in Camarillo, CA. The store is slated to open in April. The building was previously occupied by a Fresh & Easy Neighborhood Market that closed in 2015. It is less than a half-mile from a Sprouts Farmers Market. Nordstrom announced the closure of two full-line stores, in Norfolk, VA and Wellington, FL, effective April 5. President Jamie Nordstrom commented, “Looking at the needs in these markets and the investments needed to sustain these stores, we decided it made the most sense to close these stores and focus on other ways we can best serve our customers, including nearby Nordstrom and Nordstrom Rack stores as well as online.” Earlier this month, Nordstrom reported that holiday sales at its full-line stores were below expectations and required higher mark-downs to clear unsold inventory. Meanwhile, online holiday sales were up 18%. Nordstrom is not the only department store chain closing stores this year. Collectively, Macy’s, J.C. Penney, Kohl’s and Nordstrom are closing 19 stores. Macy’s is closing eight stores this year, including stores in Casper, WY; Redmond, WA; Sunnyvale, CA; Indianapolis, IN; Swansea, MA; McLean, VA; Nanuet, NY; and Charleston, WV; it is also closing a furniture gallery in Los Angeles, CA. In addition to the two previously mentioned store closures, Nordstrom is shuttering a store in Providence, RI. Kohl’s is closing stores in Rego Park and South Valley Stream, NY; Lenexa, KS; and Bayou Cane, LA. J.C. Penney announced earlier in January that it would be closing three stores this spring but has yet to disclose specific locations. On January 16, Bloomingdale’s announced the opening of a new 36,000 square-foot beauty department at its 59th Street flagship store in New York City. The new department features a fragrance hall, a hair and nail bar, and spa rooms. Of the more than 200 brands the new department will have, 75 are new. The beauty department revamp is part of a larger update at Bloomingdale’s, which has also upgraded its home, shoe and ready-to-wear departments. Other department stores have upgraded their beauty departments as well, including the chain’s parent, Macy’s, and Hudson’s Bay’s Saks Fifth Avenue. In September, Bloomingdale’s launched Wellchemist, “a clean beauty boutique,” at the 59th Street flagship store and at nine other locations in New York, New Jersey, Maryland, Florida, and California. But the newest upgrades to the 59th Street flagship beauty department are more focused on new tech enhancements and on improving the shopper experience. This is to compete better with Sephora and Ulta, which encourage shoppers to enjoy services and lessons in store. Foot Locker unveiled a new store model last week, dubbed the “Power Store” in Eastpointe, MI, just outside of Detroit. The 8,500 square-foot space features a women’s shop-in-shop and a Kids Foot Locker. The Company currently operates “Power Stores” in England and Hong Kong, and is expected to open more than a dozen such concept stores this year, including in Los Angeles, New York and Philadelphia in the U.S. and Milan, Italy. The concept is meant to serve as a “hub for local sneaker culture, art, music and sports,” according to the Company.